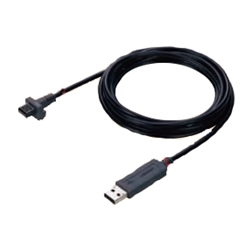 The Mitutoyo USB-ITN USB input tool direct allows connection of your Mitutoyo digimatic digital tool directly into the USB port on your computer. Simply select the correct cable end (A-G see chart below) that matches your tool. No special software required. Measurement data can be loaded directly into an Excel spreadsheet by connecting the instrument and USB-ITN tool to the computer. NOTE: some high-precision Digimatic gages are capable of displaying the measurement result to more than 6 digits. However, according to the Digimatic output specification, the result may be output in 6 digits only. Digimatic gages whose display may exceed 6 digits include: laser scan micrometers, litematic, linear gage counter (EH), high-accuracy digimatic micrometer.